Sophomore utility Jaleh Moaddeli has scored 12 goals for the Colonials this year. 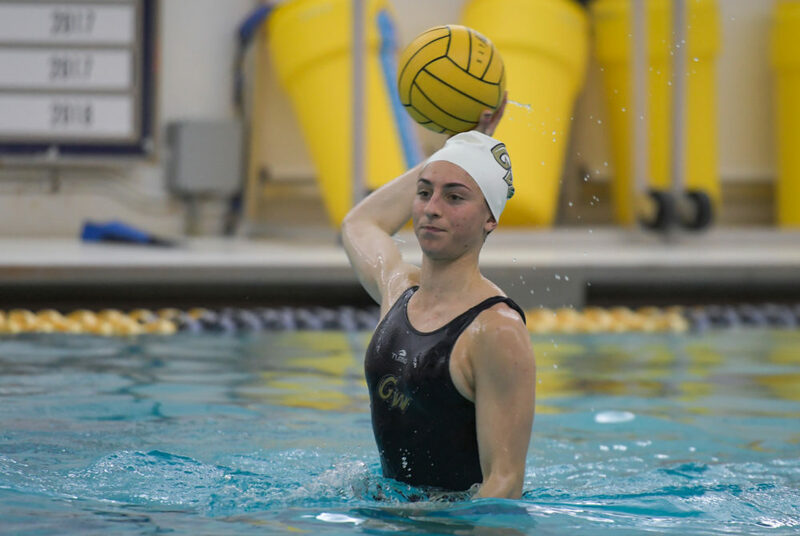 Six games into the 2019 season, women’s water polo is still working to get familiar with each other in the pool. With a young and eager roster on his hands, head coach Barry King said about a third of the way into the season, the Colonials (3–3) still need to learn how to play through four quarters of a game, despite seeing growth in his squad overall. The Colonials opened the season with a 13–10 victory over St. Francis Brooklyn earlier this month. GW sealed the win with a 5–1 showing in the third quarter to boost its lead to four goals heading into the final frame. But in their four games last weekend, the Colonials have been coming out slow from the halftime break, with opponents outscoring them a combined 12–5 in the third quarter. After carrying a two-goal lead into halftime, the Colonials let the Terriers outscore them 3–1 in the third frame to knot the score before collecting four goals in the final frame to take the 12–10 win Sunday. GW was tied 4–4 with Brown before being held to one goal while the Bears tacked on four goals in the third quarter to their score to ultimately take the win 12–7 later that day. King said he could see his players starting to understand where they were supposed to fit in on offense even though the team split the weekend. Once his players get comfortable in their roles in the pool, the team will be able to play more evenly-paced quarters, he said. King, who took the helm of the program last season, said although the team has had a year of experience playing under him, this season is a “whole new ball of wax” with four freshman faces in the pool and new players in leadership roles. Sophomore utility Alana Ponce leads the Colonials with 23 goals and a 54.8 attack percentage. Freshman utility Juliette Belanger – who notched nine goals over the weekend – and sophomore utility Jaleh Moaddeli currently have 12 goals each to their name. King said his team is focusing more on the process of improvement as it moves through the season. In every game, GW’s scoring has been spread between at least three players, and twice this season the Colonials have been able to spread out their scoring between six players. Junior goalkeeper Samantha Runyon, who has collected 44 saves for the Colonials between the pipes, said some days there are not enough players in the pool to scrimmage against each other at practice. The games last weekend helped the team see how it really stacks up against competition, she said. Runyon said the lack of senior leadership has been “tough” even with the team’s five juniors stepping up to lead, but going forward, she wants her team to focus on implementing a new defensive tactic and staying organized when guarding the ball. “Although we weren’t as successful as we wanted to be, I think that there’s a lot of potential going forward to be more successful,” Runyon said. The Colonials play their first College Water Polo Association match of the season against Princeton March 9. Swim-off is slated for noon. This article appeared in the March 4, 2019 issue of the Hatchet.